One of these major changes is the globalization of higher education and its impact on the Intensive English Language market in America. By and large, the trend toward an increasingly educated global society has been a boon to education institutions in the United States where American colleges and universities have historically attracted new students from around the world with few other countries stepping in to provide a viable competitive threat. Yet, here we are again, faced with the ever-constant presence of change. As we pointed out in our EvoLLLution of Higher Education series, International English Language Program enrollments in the United States are poised to be disrupted by changes in the local markets of countries like China and Saudi Arabia. In addition, strong English Language Programs in countries like England and Australia are starting to loosen the United States’ stronghold on this type of lucrative student enrollee. 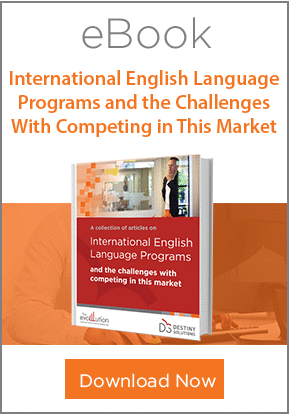 On the cusp of this change, International English Language Programs (IELPs) in the United States are continually being expected to do more with fewer internal resources while also responding to more competitive demand globally for what was once a locked market. IELPs can overcome these myriad challenges by fine-tuning their student experience to attract, retain, and support their learners through every step of the IELP student lifecycle. Program planning is the anchor to which all other components of the IELP student lifecycle are tethered. Instituting a strong programming base is integral to ensuring that all subsequent components can be executed effectively. The first step for IELP directors is to coordinate the numerous stakeholders involved in the planning, creation, and approval process of program deliverables. Such coordination aims to address and eliminate roadblocks with staff responsibilities, timeline management, review and approval process, and course catalog updates. In order to address these common roadblocks and create a well-ordered and scalable framework, administrators should create a solidified digitally-powered business process workflow that defines tasks for completion, assigns them (automatically) to the appropriate person, and contains built-in timelines and reminder prompts. The ideal workflow, will give IELP administrators a birds-eye view of the entire process with the ability to step in to resolve bottlenecks the instant they start to cause delays. By developing and using a cohesive framework, courses get to market faster and more efficiently thus increasing enrollments, reducing costs, and providing competitive differentiation. As a first step, coordinating the many players that likely exist in your program will place your staff, your students, and your program on a solid base that will insulate you against changing market conditions and an increase in global competition. To read more about how to improve the IELP student lifecycle, you can download the playbook, “Navigating the Student Lifecycle” which reviews more common challenges and solutions to managing this complex, but highly lucrative, cohort of students.